Growing up in Pennsylvania, Doug McKnight was captivated and obsessed with fishing at a very early age. Hunting and fishing in the McKnight household is a family tradition, and his Father Ron and Grandfather Stanley, always made the time to take him and encourage him to follow outdoor pursuits. “I have been a bit of a fishing nut since I could remember”, Doug recollects. “My Dad can attest to the number of times that I begged him to take me fishing at every possible moment, luckily for me, my Dad likes to fish and spend time outdoors as much as I do.” “As I am sure that most people who have tried fly fishing can relate, fly fishing did not come all that easy at first. When I was 13, I remember it taking everything I had to make a fifteen foot cast with a fly rod that I bought at a Flea Market for $5.” However, with some good instruction Doug became a good caster and a proficient angler. When he was 18, he began guiding anglers on waters in Pennsylvania. 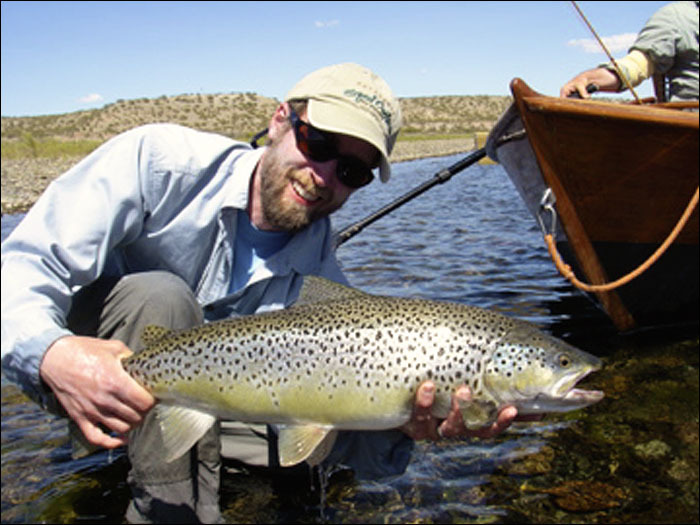 “Teaching people while you are guiding them makes you a better angler, and after a few years of guiding, my fly fishing skills had really improved.” In 1997, Doug worked a summer inside Yellowstone National Park; little did he know that it would change his life dramatically. “I really wanted to fish out west, and I jumped at the chance to spend a summer working out there and getting an opportunity to fish some legendary water, even if it meant being a janitor”, Doug jokes. “Yellowstone Park and the surrounding areas in Montana, Wyoming and Idaho, really knocked my doors in. The fishing was the best that I had ever seen and the people and towns were a bit of a revelation to me. I had also met a woman from Texas while working in the Park, three years later I asked her to marry me. That summer in the Park really set my life as I know it today in motion.” A year and a half later Doug moved to Texas to be with Shayla, and he quickly gained employment at Westbank Anglers, an upscale fly shop in Dallas Texas. 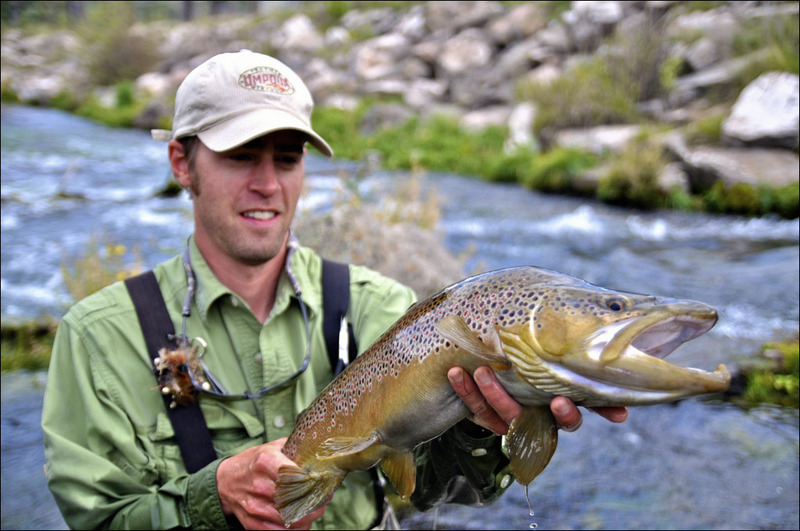 “Working in Dallas was great, I got the chance to host clients on fly fishing trips around the world to some incredible destinations.” However, after 6 years in the hot Texas sun in the big city, both Doug and Shayla were ready to move back up to the Northern Rockies where they first met, and be right in the heart of some of the best water in the US. Doug began tying flies at age 9 under his father’s instruction along with a few instructional books. “Way before I was a proficient tyer, I was experimenting with my own patterns, copying insects from my backyard. It really sparked some creativity in me that I didn’t know that I had”, Doug says. “I learned as much as I could from books, but my parents suggested that I try a fly tying class at an adult evening school, I learned from some great tyers and very quickly became very proficient at tying flies. “ A few years later, Doug McKnight was tying flies professionally for some local fly shops, as well as doing some guiding. “In my late teens, I pretty much decided that I wanted to make creative fly tying a part of my living.” “I got into tying fishing flies, as well as crafting more artistic flies meant for display rather than actual fishing flies, like Victorian age Atlantic Salmon flies.” For nearly two decades, Doug McKnight has built a reputation as an expert fly tyer in nearly every facet of the craft. From trout flies, bass, saltwater, big game flies, deer hair flies, realistic flies, Atlantic Salmon flies, Doug is a versatile fly tyer and his creativity shines through in his many flies. In 2003, Umpqua Feather Merchants signed him up as a signature fly tyer, and you can buy his unique fly patterns in fly shops around the world. 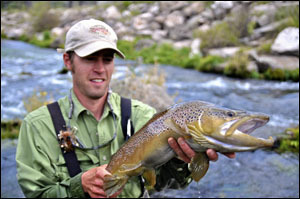 In 2010, Fly Fisherman Magazine published a streamer- tying article written by Doug that was very well received. He continues to write for regional and national publications. Doug McKnight, in recent years, has been working on his fine art of oil paintings, pastels and pen and pencil drawings. “I am primarily a self taught artist, and don’t have much in the way of formal training as an artist. I have always been into drawing fish, insects and flies, lately I have been a lot more serious developing my fine art skills.” Doug’s art is carefully rendered and his meticulous nature lends itself towards recreating beautiful and accurate images with emphasis on the angler’s world. Today Doug McKnight resides in Livingston, Montana where he lives with his wife of 10 years Shayla, son Caleb Finn, and faithful and crazy Bird dog Hawk. He splits his time between guiding, fly tying, his varied artwork, hunting and fishing, and spending time with his family and friends.